Although there are many modes of public transport, sometimes taking a car to work is the only viable option. This might be because the workplace simply isn’t accessible via public transport, or too far away to cycle or walk to. But with so many people taking to the road each morning to commute, the journey into work can be stress-ridden, as well as proving expensive. It is thought that the average car journey costs around 25p per mile for your average compact hatchback. And taking into account that many people with travel over 30 miles one way to get to their place of work, the cost of commuting over a week, month and year can take a significant chunk out of a pay packet. One great solution to slashing this cost is to take part in what is known as ‘car pooling’, or ‘car sharing’. 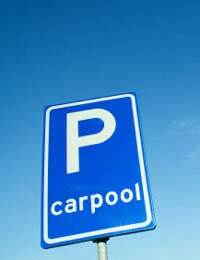 Car pooling is a simple scheme where two or more people that travel in the same direction or to the same location share car journeys. Drivers are allocated on a rota system so that the job of driving and the cost of petrol is spread out between several people. Car pooling schemes are usually set up so that colleagues in the same company. Occasionally, different companies that are located in close proximity – such as within the same business park or industrial estate – may organise a larger-scale scheme. Of course, the most obvious benefit of taking part in a car pooling scheme is that you can save money. And the more people that enter into the car pool, the greater the saving that will be made by everyone involved. For instance, if you car pool with one other person, you half the cost of commuting (and parking). But filling your average hatchback or saloon car with 5 people will reduce the cost to just 20%. In addition, some insurance companies also offer incentives, knocking further costs off the price of insurance policies for those who actively car pool. Furthermore, it is thought that if those who frequently drive to work actually took part in a car pooling scheme, then the number of vehicles on the road would be dramatically reduced – some say by around 15%. So with less vehicles on the road, the result could potentially be less congestion, and faster journey times. This in itself would reduce stress levels, making the journey into work a much more pleasant ordeal! How Do I Take Part in a Car Pool Scheme? There are a few ways to set up a car pooling initiative, each depending on the approach you want to take. It could be as easy as speaking to or emailing colleagues at work to find out if anyone wants to do a trial run. Or you could put a notice up in your local post office or supermarket. If you’re looking for something a little more formal and organised, there are a few dedicated businesses that may be able to help you. A simple search for “carpooling” or “car pooling” UK schemes on Google will be able to point you in the right direction. These agencies will locate and match you with other car poolers in your area. However, you should bear in mind that this kind of approach is still very much an emerging enterprise in the UK. However, with high fuel prices and ever-increasing congestion on our roads, car pooling is definitely a scheme that many people could benefit from.